So, let me get this right! NBC spends 9 million dollars to bring us a free, LIVE production into our living rooms, hires a formidable cast of singers and actors of considerable fame who are not intimidated to sing LIVE over a three-hour time period, hires a LIVE orchestra, technicians, engineers and Heaven knows who or what else and the reaction is basically a whiny “I could do better” rant from the media. In the age of pre-recorded, pre-fabricated, lip-synced productions which have been force fed to us, brainwashed us and made us settle for mind-numbing edited content, have we totally lost perspective here of what constitutes good or not? Or of how tremendously risky it was to create a three-hour extravaganza of one of the most-loved musicals of all time, live and unedited, free of charge, for all to enjoy? Not mention the enormous amount of planning and fortitude the production crew had to endure to make The Sound Of Music Live come together! First and foremost, let me get this out of the way now. Carrie Underwood’s portrayal of Maria was absolutely refreshing to behold. She was sweet without being saccharine, playful without being over the top and sensitive without being too “method” in her approach. In other words, she was believable and overall she took great risks with her voice. I was absolutely thrilled to hear her singing those upper soprano notes. My only problem was this: I wish the director had worked on refining her speaking voice. It sounded far too American for the setting of this musical. Her singing voice was fantastic, however. No – it was not Julie Andrews nor was it the original Maria’s , Mary Martin, (yes, there was another Maria before Julie Andrews). However, her articulation of the words, her vocal tone, even her nuanced approach, was extremely admirable. And, most assuredly, she loosened her demeanor and vocal delivery as the show moved forward. But to ban the entire production over little flaws here and there is absolutely ludicrous and downright insulting. It’s fine to have a meltdown over the casting and you need sleep aids to sleep at night to help you forget the experience but, for the love of Pete, give credit where credit is due – the production. NBC was prepared for the backlash, as was the cast, particularly Carrie, but, c’mon, in the spirit of season, let’s congratulate NBC on a job well done. And LIVE! Did I mention it was LIVE? One thing is certain – the ratings for this show are going to be through the roof and all the naysayers can congratulate themselves for this ratings boost. 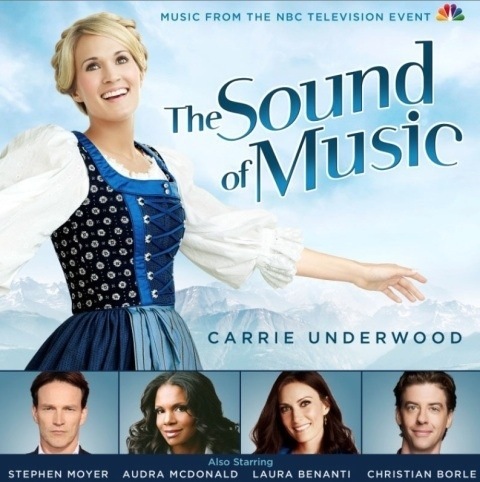 Ask yourselves – would the viewers have tuned in if Carrie Underwood had not been cast in the role of Maria? You can bet that the majority of the viewers would have replied in the negative because the majority of the viewers most probably are not musical theatre purists like you and I. But, look at it this way: Carrie’s fame and fan base attracted viewers who are now fully aware of musical theatre veterans such as Audra MacDonald, Christian Borle and Laura Benanti. And, as a lover of all things musical theatre, this is a very good thing indeed. We need to somehow make the world aware of our musical theatre artists and, if this is the beginning of the process of awareness, then so be it. And for Carrie, I congratulate her for motivating herself to move in a direction beyond country. Maybe this is the start of a new and exciting career for the country star. What did you think? I am being too lenient? Did you enjoy it as much as I? Please share in the comments but be civil and courteous. Totally agree. It wasn’t perfect, but what live play is ever perfect. Carrie sang beautifully. While yours is the first review I’ve read – I think that the naysayers are simply unwilling or unable to use their imaginations. Obviously a live performance could not be set in an alpine meadow, or in a real castle. – and that is simply the difference between a tv production and a full fledged movie production. And just as clearly, a TV staging cannot approach a theatrical production either. But given the size and spatial requirements (meaning the limitations) – I thought the production was beautiful staged. The story is an element but no matter what the medium is, the charm of The Sound f Music is and always will be the music.And no one should suggest the music is deficient. MCL, I have followed you for a long time and have always had a great deal of respect for your opinions, but have not commented until now. I just have to say THANK YOU for this review! I thoroughly enjoyed last night’s presentation. and was a bit taken back by the negativity of the other reviews I read this morning. Was it perfect? No, but it was LIVE theater and given that fact I thought the whole cast turned in admirable performances. I was particularly impressed by Carrie’s ability to pull this off as well as she did. Who knew? I hope this leads to even greater things for her. Here’s hoping last night’s performance will bring a heightened interest in musical theater and we will see more of this type of production in the future. Thanks everyone. I was taken aback by the negativity. It was beyond ridiculous. I loved the live aspect – the breathlessness in Carrie’s voice when she ran up and down the stairs with the children during the Do Re Mi sequence, the feel that you were right there – front and center – as one would be at a live stage performance, the manner in which the live orchestra altered their tempos to sync with the singers. It was so exciting. I would watch a second performance like this in a heart beat. It was magical. It has been many years since live television engaged it’s audience and gave us quality entertainment. Only a few of us remember the good old days. I am so over saturated with lip syncing and auto tuned performances; last night was a rare gift. Drowning in a sea of over produced, limited talent and scantley clothed performers on television this particular evening was suited for families and deserves the highest praise. Of course it may not have been perfect but it was real and hopefully we will see more of this type of talent again. To the entire staff of performers…THANK YOU! i haven’t watched the show, and i haven’t read any negative comments, i’m wondering who is doing all the negative commenting? i have one question, was this production done in front of an audience? i do know that stage performers get better with each performance, and, the audience/energy really helps the performers. i’m thinking that these performers may not have had an audience to interact with them? i think that would not be easy? You are right. I was skeptical, but I really enjoyed it. Yes, I liked the singing and acting in the movie more, but I liked this performance too. We do need more of Broadway and theater on the network tv. But… critics will be critics. I haven’t read the critical reviews yet though so I am wondering: the usual reviews for theater performances can be pretty harsh with the performers held to pretty high standards; they normally are much harsher than pop music reviews. So are they really unfair or do they simply judge the way they normally judge any Broadway performance? In all fairness, this is also the age of the Metropolitan Opera live in HD broadcasts which are shown on many PBS stations. PBS sometimes broadcasts musicals as well though not nearly as much as I’d have loved to. Just recently PBS broadcast Phantom directly from London. But I do agree as far as network tv goes, it seems to cater to the lowest common denominator and that this performance was a good change. I loved this production. It was very believable…Maria was an innocent young woman who knew very little about falling in love and if the chemistry had been more intense, as some critics have suggested, it would not have been as believable. You cannot compare a live play to a movie in any way. This was fresh and pure and the small glitches were endearing because you knew that there were no retakes and that made the production very special. The costumes were amazing and the singing and dancing and choreography was so fun to watch. I think those who have gone off on their negative reviews have missed the point of live entertainment. It was refreshing, entertaining and I was not in the least bit disappointed. I feel sorry for the critics who could not allow themselves to sit back and enjoy the simplicity of watching a real play without retakes and lip sinking and the fast pace of so much of the TV that we are watching that revolves around music and singing and dancing these says. Bravo, to this production. Masterclass lady thank you for the perfect right up. I totally agree with everything you said. I did not read any of the hate which I would not set myself to since I know in my heart that Carrie did a wonderful, heartfelt rendition of Maria. The perfect acting set for me was when she told the Captain how he treated his children, and when she was with the Mother Abyss for Climb Evry Mountain. just magical..
No one will ever take the place of Julie Andrews or Martin, but no one can say that Carrie did not deliver in this performance because she did. And I am sure Julie has nothing but kind words for her, and Mary was watching from above saying great job Carrie. I am most proud of my gal….. Thank you for this review, MCL. I was disappointed with the sometimes cruel and mostly negative reviews on Friday morning. I did think that Carrie’s acting wasn’t quite polished in places, however, as Richard mentioned in the previous post, in the scene when she was telling the Captain how to love his children, it brought me to tears. So she obviously was doing something right!!! Her singing was quite impressive to me. I’m honestly not a huge fan of musicals, but I have always loved The Sound of Music. I was quite happy that this was done live on TV. I think Carrie and the entire cast and production crew should be congratulated for pulling that off. And I hope that occasionally TV will offer more entertainment like this. “in the scene when she was telling the Captain how to love his children, it brought me to tears” — this scene touched me too. It was very moving. I had a chance to read the reviews, but I didn’t find anything wrong with Carry’s acting, I thought it was quite fine. I liked her Maria. I actually recorded it and plan to watch it again. I was able to see a live stage performance of The Sound of Music a few years ago here in Timmins. So I was prepared for the changes in script – the changes in order for the songs, etc. Having said that I, too, was looking forward to this TV Special. I have difficulty grasping that it cost $9 mil for a one time effort. All that work for a one time presentation. What a shame. At times I found the Capt. a bit ‘stiff’ even when he was supposed to be showing pleasure. And Carrie Underwood – for a country singer she sang so clearly! I didn’t realize she had such a vocal range (am now officially jealous!) I gather that most of Peterborough, ON had their tv’s set to this movie as she married one of the home boys! It was an interesting presentation and I, for one, thoroughly enjoyed it. They will probably sell a lot of DVD/Blu Ray renditions as stocking stuffers! My family and quite enjoyed watching the special. Indeed it was a treat to have see some fabulous performances from the comfort of our own home. I adored Laura Benanti and Audra McDonald’s portrayals of Elsa and the Mother Abbess. And I thought Carrie did an admirable job, and especially shined in the “Climb Every Mountain.” This was a huge feat to have this performance live, and I thought within the circumstances, it was a big success. NBC has announced they plan on televising another musical in 2014, which I am looking forward to very much!